1. Pre-heat oven 200º C, 400º F Gas no 6. 2. Dry fry bacon until crisp. Remove to a bowl with slotted spoon. Brush bacon fat over mushroom caps. 3. Cook mushrooms on a baking sheet in the oven for 5 minutes. 4. Meanwhile, heat butter in a saucepan. Beat eggs and milk together and pour into saucepan. Make scrambled eggs to desired consistency. 5. Stir in cooked bacon. 6. Remove mushrooms from the oven. 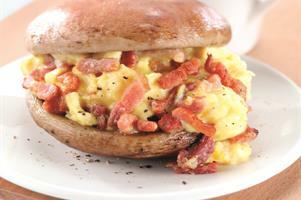 Put some scrambled egg on four mushrooms, and then top with remaining mushrooms.